Hello Toastmasters and guests! Are you feeling peppy for this week’s recap? The word of the day, peppy, can be used as an informal alternative for words such as lively and high-spirited. If you put a pinch of salt into a cup of water, the salinity of the water increases; if you put a pinch of salt into a lake, the salinity of the water does not change. 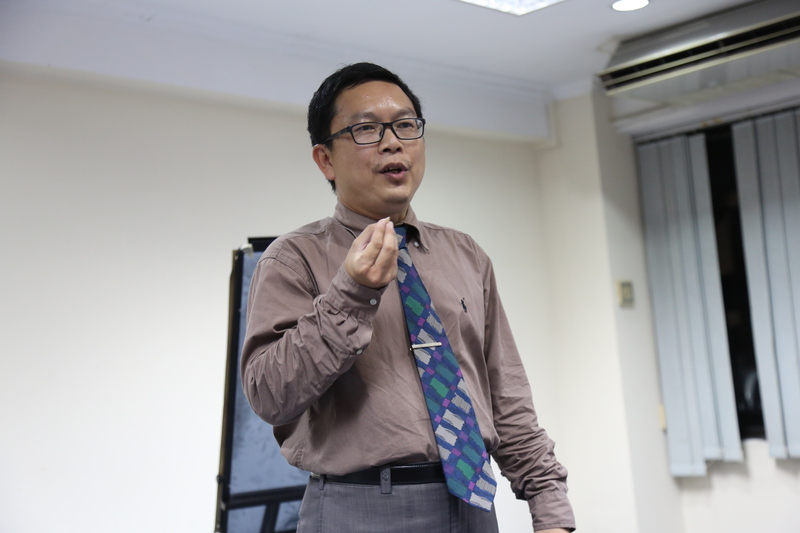 Using the analogy that salt is hatred, and the volume of water is the volume of one’s heart, our Toastmaster of the Evening, Chris Ng, encouraged us to have big hearts; forgive others’ mistakes and let go of hatred. That evening, both Tan and Gerald attempted Competent Communication Manual project no.2, i.e. Organising your speech. For our IT aficionado, Tan, FTP no longer stands for File Transfer Protocol – but – Food, Traffic, and People. As an expatriate working in Brunei, Tan cherished the variety of food Brunei has to offer him – cheap and special in its own way. Talking about traffic, Brunei has none when compared to his hometown, and he could consume less fuel and experience less stress. Warm, friendly, and kind – that was how Tan described Bruneians. How can you overcome stress and anxiety while preparing for an exam? 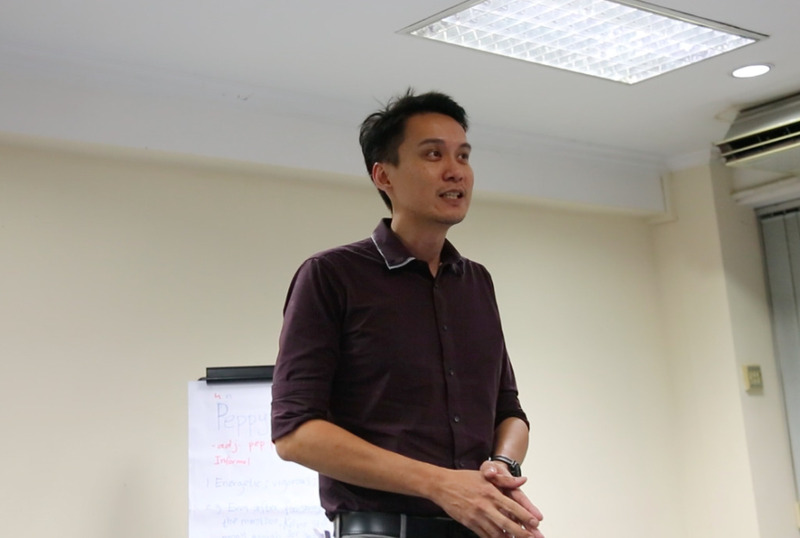 Just like how a Toastmaster prepares his or her speech, Gerald shared with us the three main skills – preparation, time management, and evaluation. By relating theory to real-life examples during preparation, we understand a subject better. Time is limited but we can excel through prioritization. To make sure that we are on the right track, ask and accept feedback with a positive attitude. Thank you, Gerald, for sharing your tips with us. 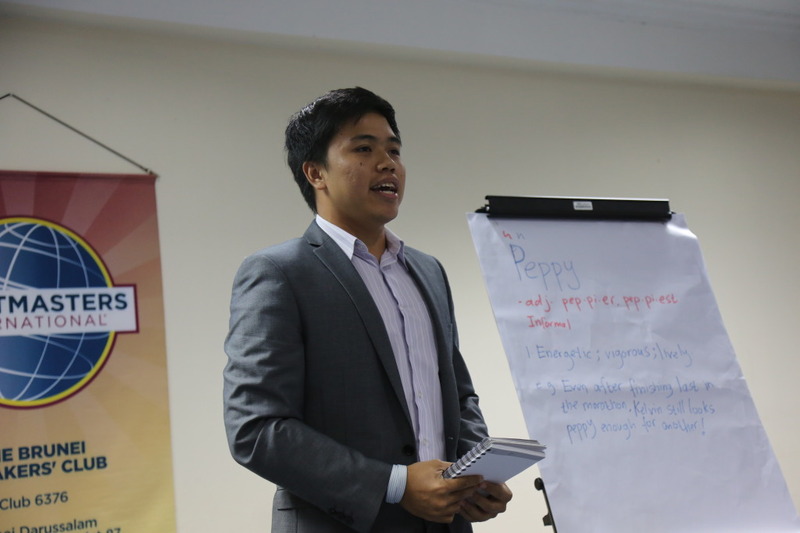 Cheerful Farhan hosted the Table Topic session with the theme – bright, happy, and peppy. 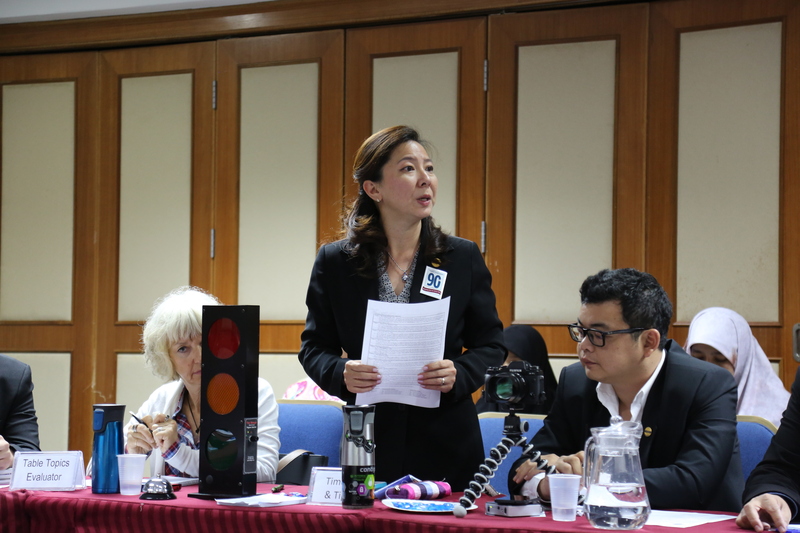 Joining Toastmaster, participating in Youth Camp, and knowing herself better through personality and career profiling, Toastmaster Ong Yin was glad that she could finally discover the final piece of her life puzzle. How would you envision yourself to start a new beginning? Toastmaster Serene wanted to travel around Australia in a caravan with her two children in 20 years; capturing the beautiful scenery and living a bohemian life. If Adibah was as free as a bird, she wanted to fly to New York, Australia and then back to the UK. Although the lifestyle might be luxurious, Adibah hoped that she would be able to afford it in 40 years perhaps. Gravity, a bandage, and a polar bear – these are the elements that playful Rayhan used in his pick-up lines while approaching random girls. “When you practice kindness, you not only learn something new, but you experience it as well.” This is the life lesson that Malik comprehended when he decided to help a 90 years old lady to carry two heavy bags. An act of kindness results in a warm feeling. Matilda expressed her appreciation to her family and friends who had helped and supported her through her difficult times. 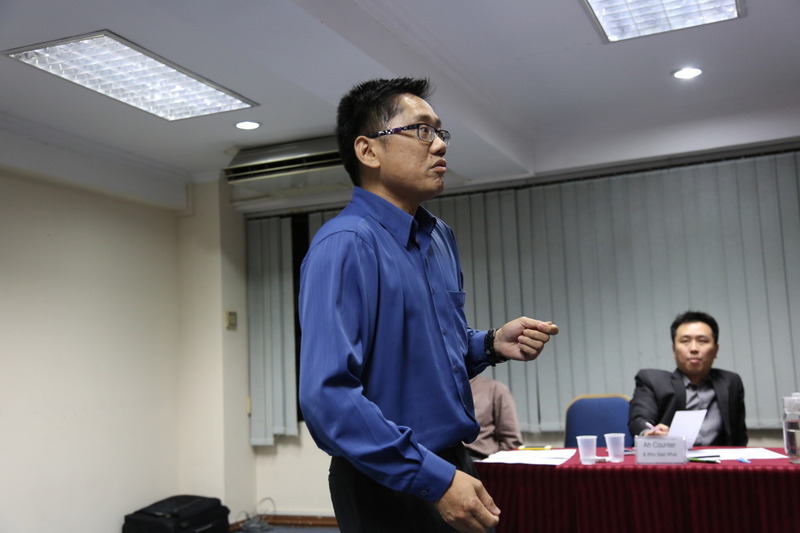 According to Amran, the luckiest thing that had ever happened to him was joining Toastmasters. Toastmasters’ members have become his second family – the family that he can rely on and the family that can make him laugh from his heart. Congratulations Amran! From a speech that lasted only 15 seconds 18 months ago, to a sincere speech that helped you win the Table Topics for the first time, your determination and courage have inspired many of us to push ourselves beyond our limits. Well done, Amran! 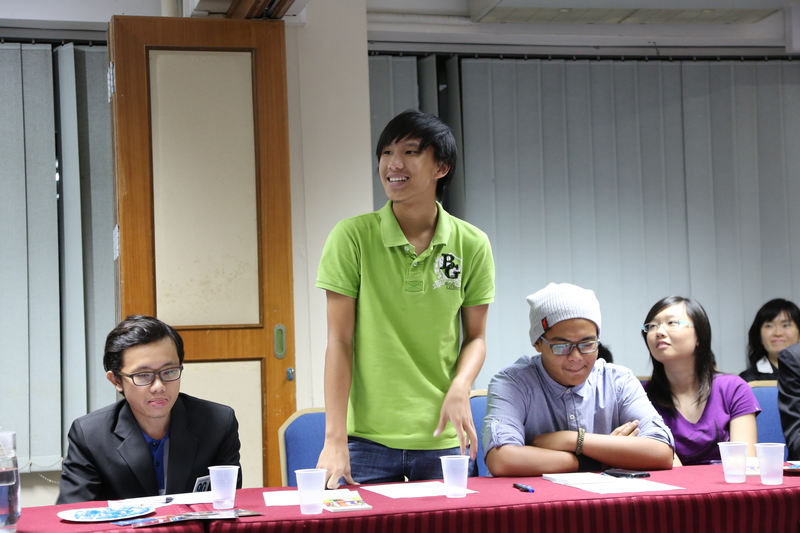 Special acknowledgements to our Toastmaster of the Evening, Chris Ng, who took the role voluntarily, and to our Grammarian, A’aqiil who took the role for the first time. Toastmasters clubs in Brunei will be having a weekend getaway to Labuan on the 10th and 11th of January 2015 through ‘Project Labuan’. It will be exciting, educational and memorable. Registration is still open. Please contact Geneviève Lai for more details. 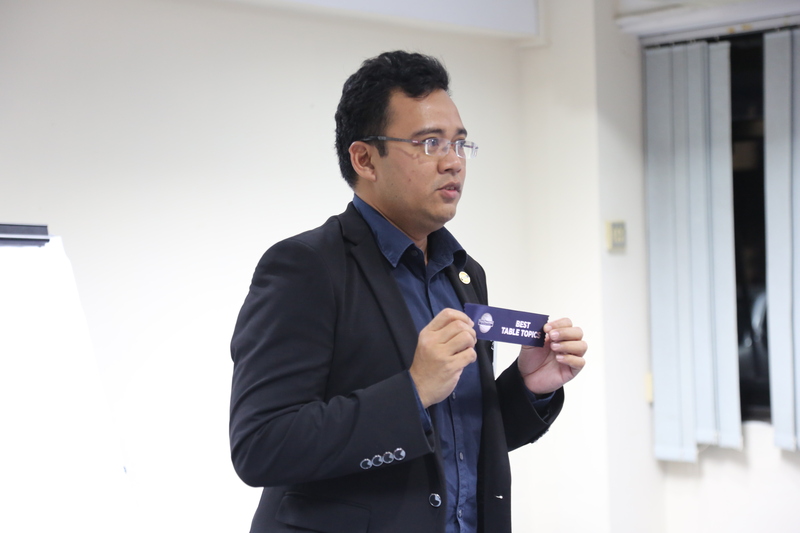 To end the night, our President, Hazwan, reminded us to remember the great moments that we had in Toastmasters. These moments would become our strength and support should we feel demotivated in times of difficulties. A memorable night we had. Cheers.